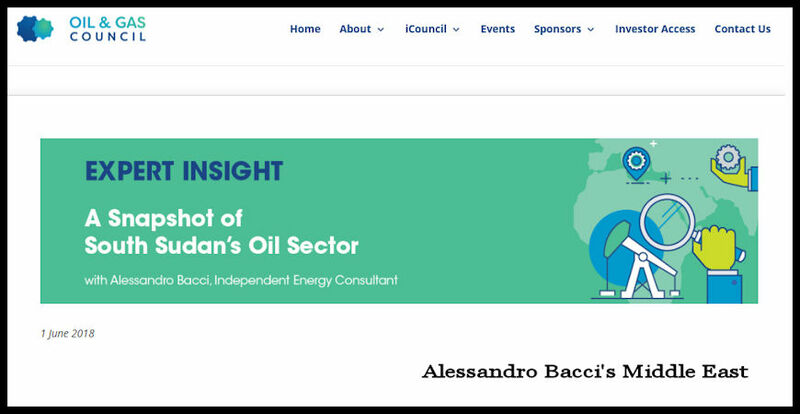 The analysis “A Snapshot of South Sudan’s Oil Sector,” has been published by the Oil and Gas Council, the leading network of energy executives in the world. 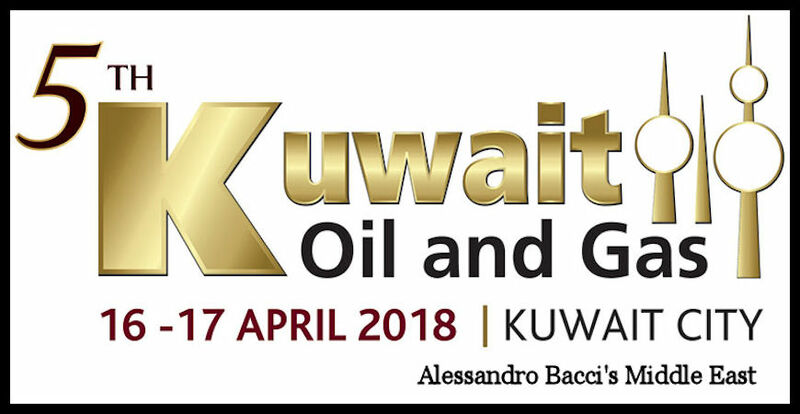 This analysis is related to Africa Assembly 2018, which is the largest African O&G finance and investment event. The Oil and Gas Council will organize Africa Assembly 2018 on June 5-6 in Paris, France. According to BP Statistical Review 2007, at the end of 2016 South Sudan had 3.5 billion barrels of proven crude oil reserves, i.e., 0.2% of the world’s proven crude oil reserves. However, South Sudan, which got its independence from Sudan in July 2011, because of several problems, such as the lack of independent export routes, border disputes with Sudan, and since December 2013 an ongoing civil war, has not been able until now to consistently develop its oil industry; on the contrary, its oil production is currently declining. As a matter of fact, in July 2011, South Sudan was producing about 325,000 b/d, while production is now about 135,000 b/d. In addition to the three above-mentioned main problems, part of the reason for the oil-production decline is also linked to the mature status of the oilfields in South Sudan’s Unity State and Upper Nile State. All the countries that rely consistently on natural resources always face difficult challenges, and they must constantly find a balance between, on the one side, their need to attract investment to explore and develop natural resources, and, on the other side, their need to ensure that the government receives a fair share of the countries’ resource wealth. To continue to develop its oil sector, South Sudan must bring in both technical expertise and financial resources, but, as a result of the above-mentioned problems, it’s not easy to find additional investors. 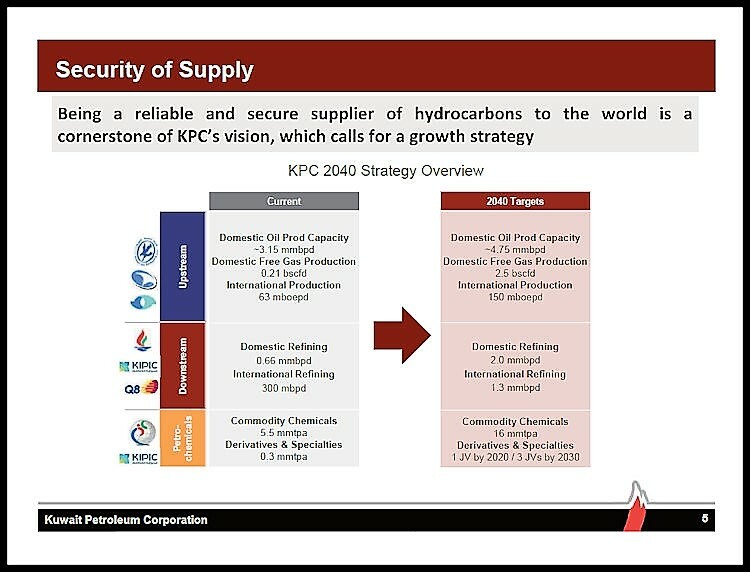 South Sudan’s petroleum fiscal framework is based on production sharing contracts (P.S.C.s), and the country is currently developing a model P.S.C. Moreover, South Sudan must pass additional legislation concerning its hydrocarbons sector. That the economic development of South Sudan would not be simple was clear well ahead of the July 2011 independence from Sudan. History tells us that before the independence from the United Kingdom in 1956 of what is today’s Sudan and South Sudan, unrest was already emerging to the surface in southern Sudan. After the 1956 independence, southern rebel groups started to fight against the central government in Khartoum for the independence of southern Sudan. Two civil wars ensued: The First Sudanese Civil War from 1955 to 1972 and the Second Sudanese Civil War from 1983 to 2005. The second civil war ended with the Comprehensive Peace Agreement (C.P.A.) between the government and the southern forces. The C.P.A. established a timeframe for organizing a referendum for the independence of southern Sudan. The referendum was held in January 2011, and then South Sudan became independent in July 2011. Despite the independence, problems for South Sudan did not stop. In particular, for South Sudan the three main problems are the lack of independent export routes, border disputes with Sudan, and since December 2013 an ongoing civil war. First, South Sudan, which is a landlocked country, is obliged to export its crude oil via pipeline through Sudan, which requires the payment of high transit fees—oil goes to Sudan’s refineries and to Port Sudan on the Red Sea from where crude oil is shipped almost exclusively to China. Some years ago, it was proposed the idea of constructing a pipeline to Kenya or Djibouti (the latter option via Ethiopia). However, because of South Sudan’s present declining crude oil production, it’s difficult to build this second pipeline if there is not a guaranteed amount of crude oil to ship through the pipeline. In this regard, a few months after the independence, South Sudan declared in January 2012 that it would shut down its production because of disagreement with Sudan about oil transit fees—Sudan had started to confiscate the oil passing through its territory. Later, the South Sudan’s army together with Sudanese opposition forces occupied the Heglig oilfield for about a week before Sudan took it back. This oilfield is administratively located in Sudan, but it straddles the border between Sudan and South Sudan. Because the occupying forces had destroyed part of the oilfield infrastructure, Sudan’s oil production was temporarily reduced by 50%. Only in November 2012, was it possible to find a solution defining oil transit fees and a compensation measure for the lost production. Oil production restarted only in April 2013. However, the problem of the transit/debt repayment fee is a big problem for South Sudan. According to the agreement in 2012, South Sudan was obliged to pay for 3.5 years to Sudan for each barrel of oil shipped through the Sudanese territory $15 as debt repayment and $9.1 as transit fee for the oil produced in Upper Nile State (Block 3 and Block 7) and $11 for the oil produced in Unity State (Block 2 and Block 5A). With such a high amount of fees paid to Sudan, for South Sudan low oil prices might really eat away at all the profitability relating to its oil production activity. On top of this, it’s important to underline that South Sudan’s two main crude oil blends, the Dar blend (25.0 A.P.I. degrees and sulfur content of 0.11%) and the Nile blend (33.9 A.P.I. degrees and sulfur content of 0.06%) trade at a discount to Brent. While the Nile blend trades at a small discount, the Dar blend is strongly discounted because it trades at $7 to $10 less than the Brent’s price. After a year of negotiations (South Sudan wanted to change the terms of the agreement), at the end of 2016, Sudan and South Sudan extended the fee agreement for three other years. The agreement between the two parties has not been released publicly, but according to some ministerial sources, it appears that if oil prices are below $30 per barrel, South Sudan will pay only the regular transit fees (a $9.1 transit fee for the oil produced in Upper Nile State and a $11 transit fee for the oil produced in Unity State). But if prices reach $61 or more, South Sudan must pay, in addition to the standard transit fee, also the full $15 debt repayment fee. Instead, between the two thresholds, South Sudan must pay a reduced debt repayment fee according to a sliding scale. Second, the border between Sudan and South Sudan at certain locations, such as around the Abyei area and the Heglig oilfield, is disputed. The reason is that in those areas oil fields straddle the border between Sudan and South Sudan. The Abyei Area is an area of 4,072 square miles. The 2004 Protocol on the Resolution of the Abyei Conflict accorded "special administrative status" to the area. According to the protocol, this area was declared, on an interim basis, to be at the same time part of both Sudan and South Sudan. Instead, Heglig is a small town on the border between Sudan’s South Kordofan State and South Sudan’s Unity State. Both countries claim the Heglig area, but it’s presently administered by Sudan. Third, the ongoing civil war, which started in December 2013, between forces of the government (Sudan People's Liberation Movement) and opposition forces (Sudan People's Liberation Movement in Opposition). Several ceasefires have been reached since January 2014, but nothing has resulted in a definitive and permanent agreement. In specific, the Compromise Peace Agreement (C.P.A. ), signed in August 2015, seemed to be the right one, but then in July 2016 fighting started again. Currently, rebel in-fighting is a major part of the fighting. According to the United Nations, in 2017 out of a population of 12 million, there were 1.5 million people who had fled to neighboring countries (primarily to Kenya, Sudan, and Uganda) and more than 2.1 million of people who were internally displaced. In addition, fighting occurs in agricultural lands as well, and, as a result, this year, also during harvest time in January, more than 5.0 million people did not have sufficient food to eat. So, it’s almost sure that in the summer of 2018 half of the country’s population will be on the brink of famine. Recently, the United States and the international community have increased theirs sanctions on South Sudan as a response to the present chaotic destabilization in the African country. In February 2018, the United States announced that it was implementing restrictions on the export of defense articles and defense services into South Sudan. And then, in March 2018, the United States imposed sanctions on 15 South Sudanese oil operators because according to the United States money from these oil companies was used for purchasing weapons and funding irregular militias, which undermine the peace, security, and the stability of the country. For many developing countries that export raw commodities, commodities play a substantial role in their economy, and South Sudan does not escape this condition, and it is one of the most oil-dependent countries in the world. In fact, South Sudan has an economy practically exclusively relying on the export of crude oil. 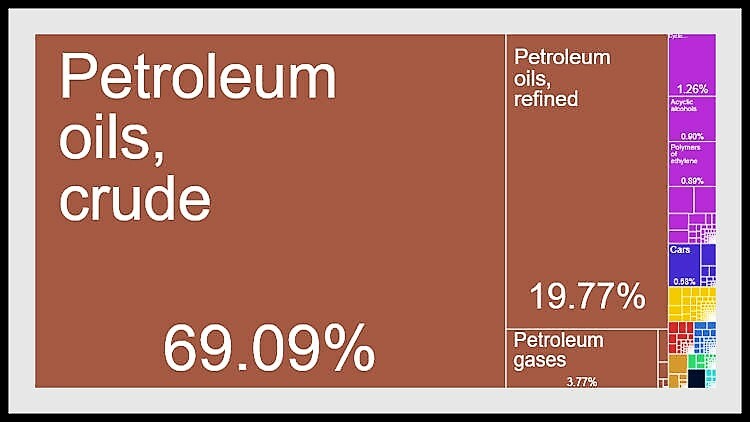 Harvard University’s Atlas of Economic Complexity shows that in 2016, 98.71% of South Sudan’s exports (for an amount of $1.39 billion) was categorized as “petroleum oils, crude.” The remaining, but almost negligible, export included other oil seeds and oleaginous fruits, dried leguminous vegetables, flour and meals of oil seeds or oleaginous fruits, and peanuts; vessels and other floating structures for breaking up (scrapping); ferrous waste and scrap, and re-melting scrap ingots of iron or steel; commodities not specified according to kind; and cotton, not carded or combed. And, in the previous years after the independence, the percentage of crude oil exports was more than 99%. At the same time, oil accounts for 98% of the government’s annual operating budget and 60% of the G.D.P. These numbers tell that, apart from the petroleum sector, South Sudan’s economy is a subsistence economy based on agriculture and humanitarian assistance. In practice, for an economy so strongly dependent upon the export of a single raw commodity, a reduction in production and/or a decline in the price of the exported commodity has always a devastating impact. And, this is what happened between 2014 and 2017, when in South Sudan oil production declined, and oil prices were low on the international markets. Most of South Sudan’s proven oil reserves are in the Mugland Basin and in the Melut Basin, which straddle the border between Sudan and South Sudan. However, as in many other African countries, hydrocarbons exploration has been quite limited, and a large part of South Sudan’s territory is still unexplored for oil and gas—additional exploration is required, but it needs high expertise and important financial resources because of the difficult geographic conditions of part of the territory (for instance, the Sudd). As of today, the associated natural gas is primarily flared or reinjected—the country has 3 trillion cubic feet of proven natural gas reserves. 1 — Greater Pioneer Operating Company (G.P.O.C. ), which comprises China’s C.N.P.C (40%), Malaysia’s Petronas (30%), India’s O.N.G.C. (25%), and South Sudan’s Nilepet (5%). A simple look at the companies involved shows that most of the investors in South Sudan’s oil sector are primarily Asian oil companies. This is due to the difficulties in the 1980s and 1990s between Sudan’s government (when South Sudan was still part of Sudan) and the United States. These difficulties forced Western oil companies (for instance, U.S. Chevron, Canada’s Talisman, and Austria’s O.M.V.) out of Sudan, so the Asian companies filled the vacuum left by the Western companies. G.P.O.C. is the operator at Block 1 (Unity field, Toma field, and Munga field), Block 2 (Heglig field and Bamboo field), and Block 4 (Diffra field and Neem field). D.P.O.C. is the operator at Block 3 and Block 7 (Palogue field and Adar-Yale field). S.P.O.C. is the operator at Block 5 (Mala field and Thar Jath field). G.P.O.C. produces exclusively the Nile blend, while D.P.O.C. and S.P.O.C. produce the Dar blend. In any case, these Asian companies are not presently investing in South Sudan as much as they should. Without consistent investments in both enhanced oil recovery (E.O.R.) and in new exploratory activity, South Sudan’s production could become less than 100,000 b/d in just a few years. 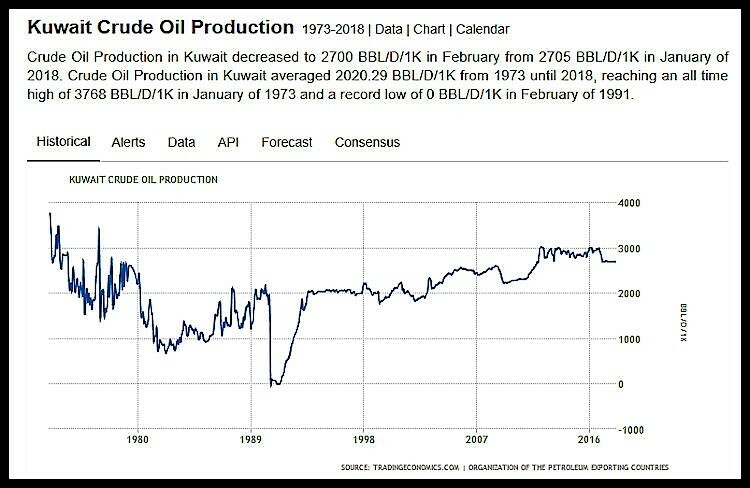 According to the World Bank, on current reserve estimates, oil production is expected to reduce progressively in the coming years and to become insignificant by 2035. Good news is that in March 2018, Petronas extended its contract to explore and produce oil and gas in Block 3 and Block 7 as part of the D.P.O.C. consortium. At the same time, Petronas committed to invest in the resumption of production at the conflict-hit Unity field (Block 1A), which, together with other oil fields, had been shut down in 2013 because of fighting activities in the area. It’s important to underline that the D.P.O.C. consortium is the only one of the three main operating consortia in South Sudan that continued with its oil production at its fields while fighting made the other two production areas, the S.P.O.C. and G.P.O.C., inaccessible to the operators. Some months ago, the government of South Sudan conducted security surveys in relation to the S.P.O.C. and G.P.O.C., areas, and then it declared that they are once again safe for oil operations. The improved conditions on the two areas was verified by a security risk assessment conducted by a private sector contractor. In South Sudan, the Ministry of Petroleum and Mining is the institution managing the petroleum sector. Instead, the National Petroleum and Gas Commission (N.P.G.C.) is the main policymaking and supervisory body. Among its main tasks there is to approve the petroleum agreements on behalf of the government. The Nile Petroleum Corporation (Nilepet) is South Sudan’s national oil company. Until today, Nilepet has had a limited role in the on-the-ground oil operations because of its limited technical expertise and limited financial resources. Nilepet has very small stakes in the operating consortia. There are three main legal documents that define the structure of South Sudan’s petroleum fiscal framework: South Sudan’s Transitional Constitution, the 2012 Petroleum Act, and the 2013 Petroleum Revenue Management Act. In 2012, South Sudan passed the 2012 Petroleum Act, which defines in a general manner South Sudan’s petroleum fiscal regime. Additional legislation must be enacted—a model production sharing contract (P.S.C.) is under development. South Sudan’s petroleum fiscal system is based on P.S.C.s. Many oil blocks were already allocated by the Sudan Government before South Sudan became independent in July 2011. —Art. 7 (Principles and Objectives) 1 affirms that petroleum existing in its natural state in the subsoil of the territory of South Sudan shall be owned by the people of South Sudan and managed on their behalf by the government. —Art. 17 (Reconnaissance Licenses) 2 affirms that a reconnaissance license grants a non-exclusive right to undertake data collection (including seismic surveying), processing, interpretation and evaluation of petroleum data in the area stipulated in the license. —Art. 17 (Reconnaissance Licenses) 3 affirms that if deemed necessary to establish a commercial basis for an exploration survey in a block or portion of a block, the Ministry of Petroleum and Mining shall announce an open, transparent, non-discriminatory and competitive public tender for an exclusive reconnaissance license in an area not already covered by a reconnaissance license. —Art. 18 (Tendering Procedure and Qualification Requirements) 1, affirms that exploration, development, and production of petroleum shall be carried out in accordance with the terms of petroleum agreements, the 2012 Petroleum Act, and any other applicable law. —Art. 18 (Tendering Procedure and Qualification Requirements) 2 affirms that petroleum agreements shall be entered after an open, transparent, non-discriminatory and competitive tender process conducted in accordance with applicable law governing public procurement. —Art. 20 (Incorporation and Organization Requirements) 1 affirms that an entity entering into a petroleum agreement shall be incorporated and registered as a company in South Sudan in accordance with the applicable law. This company shall be incorporated as a single-purpose company exclusively for petroleum activities in South Sudan. —Art. 25 (Term) 1 affirms that a petroleum agreement may be entered into for a period not exceeding 25 years. —Art. 26 (Exploration Period) 1 affirms that petroleum agreements shall provide for an exploration period not exceeding six years from the effective date of the agreement. —Art. 26 (Exploration Period) 2 affirms that the exploration period shall consist of a first commitment period and up to two optional commitment periods as determined in the petroleum agreement. —Art. 33 (Restrictions on Flaring and Venting) 1,2, and 3 affirm that gas flaring or venting is prohibited, unless specifically authorized or in the event of an emergency. Investors are therefore obliged to invest in necessary facilities in order to utilize any gas they produce. —Art. 68 (Fees) 1 affirms that a contractor shall pay surface rental fee for the contract area retained under a petroleum agreement as prescribed in the regulations. —Art. 69 (Royalties and Bonuses) affirms that a contractor shall pay such bonuses or royalties as may be prescribed in regulations or as agreed in a petroleum agreement. —Art. 70 (Taxes and Customs) affirms that a person conducting petroleum activities in South Sudan shall pay taxes and customs duties in accordance with the applicable law. —Art. 71 (Production Sharing in Petroleum Agreements) affirms that production sharing shall be as agreed in a petroleum agreement. The Ministry of Petroleum and Mining shall develop a model petroleum agreement in cooperation with the Ministry of Finance and Economic Planning. Presently, there are no ring-fencing rules in South Sudan. The corporate income tax (C.I.T.) is variable according to the magnitude of the investor’s business. If the business has a turnover of up to 1 million South Sudanese pounds, of up to 75 million South Sudanese pounds, or of 75 million South Sudanese pounds or more, the C.I.T. tax rate will be 10%, 20%, and 25%, respectively. These rates apply to income deriving from oil and gas operations. Taxable income consists of worldwide income for resident companies minus the allowed deductions. For companies that are not resident in South Sudan, taxable income consists of only the profits sourced in South Sudan minus the allowed deductions. The incurred exploration costs are deductible over the useful life of the asset. The deduction is based on the actual costs incurred, the units extracted, and the estimated total extractable units. The incurred losses can be carried forward for five years, but carryback is not available. A loss from oil and gas operations can be offset against any profits available during the successive five-year period. The Investment Promotion Act provides for various tax incentives, including capital allowances ranging from 20% to 100% of eligible expenditure, deductible annual allowances ranging from 20% to 40% and depreciation allowances ranging from 8% to 10%. A foreign tax credit is granted to any resident company paying foreign taxes on income from business activities outside South Sudan. 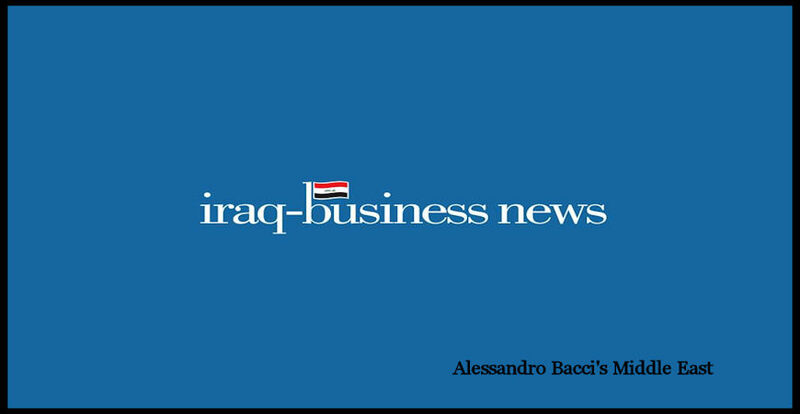 ABSTRACT — Iraq’s fifth licensing round was related to the offering of 11 oil and gas blocks. 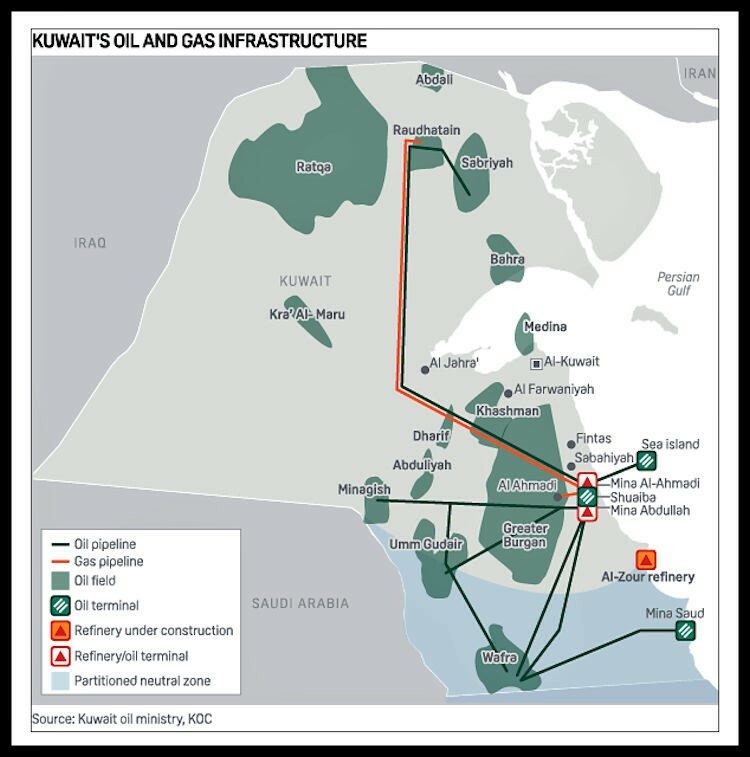 In specific, 10 onshore blocks located along the Iraqi borders with Kuwait and Iran, and 1 offshore block in the Persian Gulf waters. In the end, six blocks were awarded, while five of the exploration blocks did not receive any bids. One initial explanation for the mixed result might be that the Iraqi government, for political reasons linked to the upcoming national elections, had previously changed the date of the auction. So, the international oil companies (I.O.C.s) did not have sufficient time to study the dossier relating to the 11 blocks on offer. With reference to the contracts, the Ministry of Oil has introduced some amendments that have changed the structure of Iraq’s service contracts. The amended contract is different in that it sets a link between oil prices and the remuneration given to the I.O.C.s. At the same time, it introduces a 25% royalty on gross production. Thanks to the new contractual structure, the government would like to force the contractors to act in a more efficient manner. 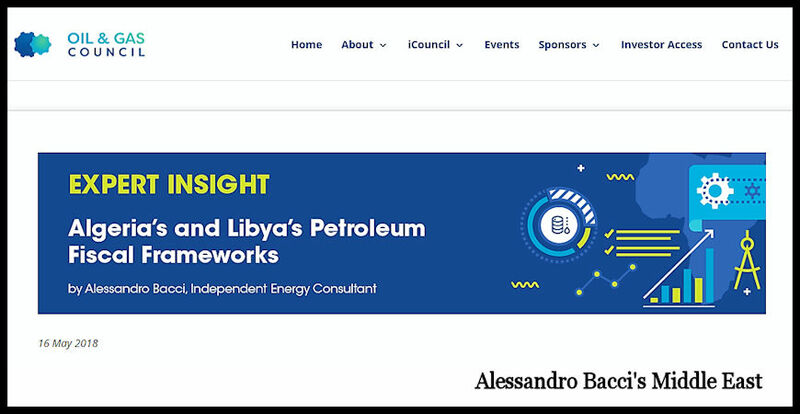 I would like to share with you the presentation that I gave at the European Chapter Event International — Petroleum Scholar Workshop, which was organized in London, United Kingdom, by the Association of International Petroleum Negotiators (A.I.P.N.) on April 26, 2018.